Long before “modularity” and “high tech” entered the design lexicon, Charles and Ray Eames were using industrial production techniques to extend the boundaries of design and create a modern aesthetic. These desk and storage units complement each other, and each can stand alone. They provide ample storage, work and display space. And at home or in the office, they look as striking now as they did when first introduced in 1950. These pieces offer more than just arresting good looks. They’re designed and built to meet your work surface, storage and display needs in a very practical way. Choose the classic desk with an easily accessible storage or display area and a handy drawer on the left or right that accommodates hanging file folders. 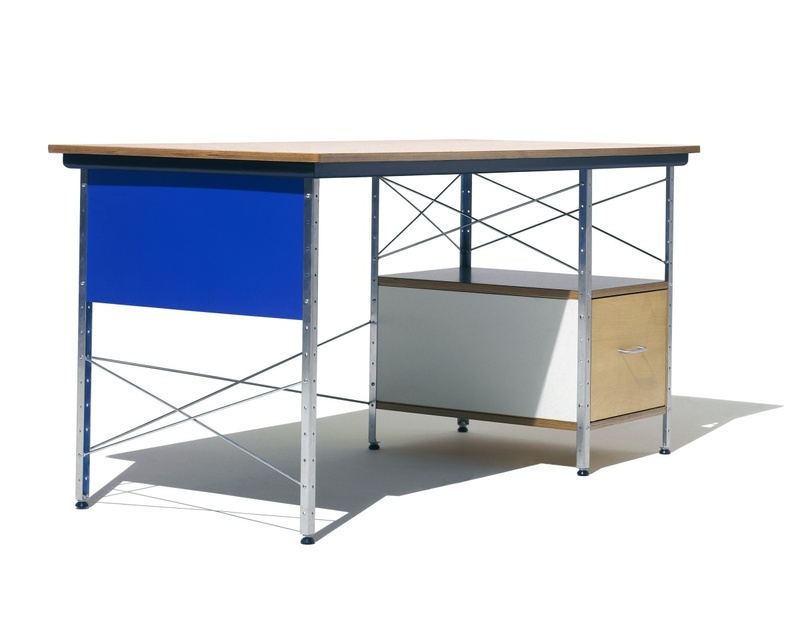 Or the new smaller desk, with open wire shelving for storage, that is ideal for today’s smaller technology and smaller spaces. Storage units include cases, cabinets and drawers in five configurations and four sizes. Combine with a desk or use single pieces on their own. Have as much fun as you want. Desks and storage units are offered in two colour schemes: neutral or bright. The neutral scheme uses birch veneer with white and black accents to create a sleek, high-tech look. The bright scheme uses red, blue, black and white hardboard panels and surfaces that are reminiscent of a Mondrian painting. Cross-supports, uprights and perforated panels have an industrial feel and are available in zinc plating or in new black anodised zinc plating. They give the units an industrial feel, and the dimpled plywood on cabinet fronts and plywood drawer fronts and shelves reinforce the furniture’s mid-century modern appearance. Uprights, cross-supports and perforated panels are steel. Drawer fronts and shelves are smooth plywood; side panels are painted hardboard and storage unit cabinet fronts are plywood that’s moulded to form round dimples. Nylon foot glides are easy on floors.